Throughout the Create Event process you'll find a number of opportunities to Enhance Your Event. The Rich-Text Formatting (RTF) toolbar is how you will access these options. An RTF toolbar is located at the top of the Organization Details, Events Details, and Detailed Ticket Explanation sections of the Create Event page. Besides text formatting, you can add web hyperlinks, images, YouTube® videos, and even work with HTML. Here you can enter the web address, the displayed text, and a ToolTip that will pop up when a user hovers over the link. 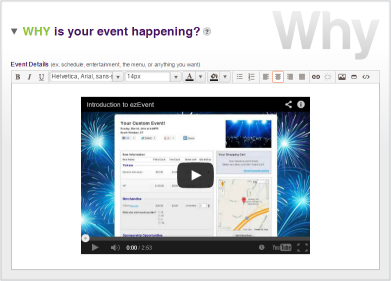 You can also choose to have this hyperlink appear in a new window, so the user may continue to browse your event. Once satisfied, click “Insert” to create the link. 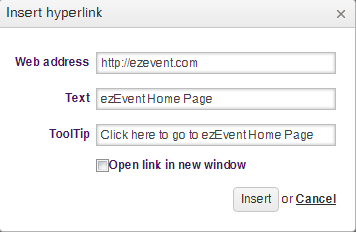 In this example suppose you wanted to insert a link to the ezEvent® home page. You would enter the website URL as the web address, enter the text that will display for the link in the Text area, and enter a ToolTip for when someone hovers over the hyperlink. Break Hyperlink. If you have a hyperlink you’d like to remove, select the link’s anchor text (text displayed as link), then click this button. The link will be removed, but the anchor text will remain. 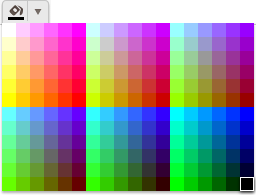 ezEvent® lets you upload images into a library and then insert any of them into these detail areas. It is easy to do in a step-by-step process. First, load the image into your account library. Next, insert the image into the detail section. You can also upload the image, close the Insert Image dialog box, and select the location you want to insert the picture. Click on the Insert Image button. This button opens the Image Uploader dialog box. Press +Upload to upload pictures from your computer. A dialog box will allow you to select from the files on your computer. 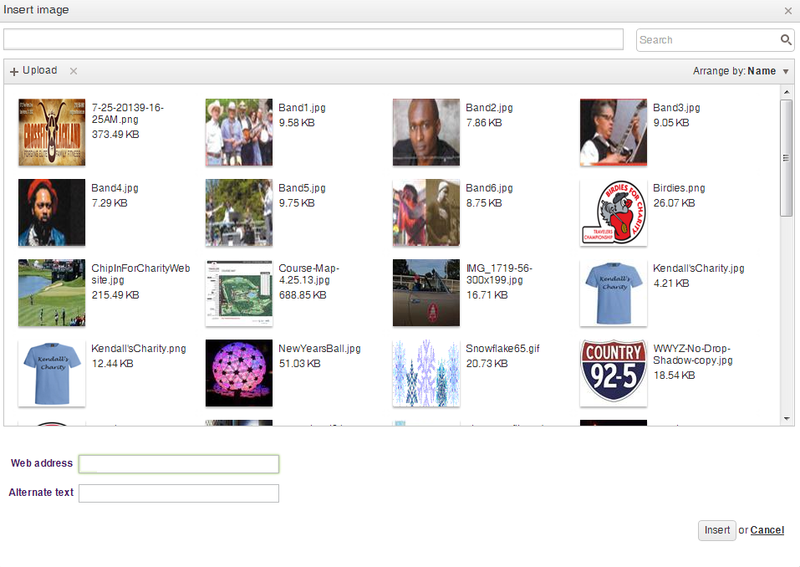 Select which image files you want to add to the library. The file(s) will be copied to your account. Select the location in the detail section where you want to add a picture. Next, press the Insert Image button to reopen the dialog box. Your picture will appear in the area of the detail section you choose. You can add as many pictures as you want along with the text, web links, and YouTube® videos you need. You can rearrange pictures, videos, and text by simply dragging them around the detail area. You can align them as well by pressing the align buttons on the toolbar. First go to YouTube® and search for the video you want to use. When you have the video displayed, click on 'Share' to display the custom URL for the clip. Copy this URL displayed under 'Share this video' (in this example: http://youtu.be/2LJEtZcRC_k). Select the place in the detail section you want to add the video. Click on the Insert YouTube® button. This button opens up the Insert Video dialog box. 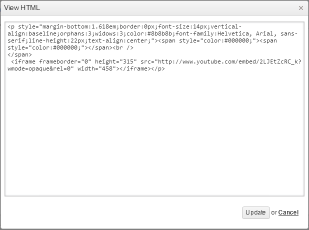 Here you can paste the URL from the YouTube® video’s Share option. The last icon in the formatting toolbar is the HTML icon . This is for use by web developers and people with an understanding of HTML. Everything you place on the detail sections – text, web links, pictures, and YouTube® video is stored as HTML code behind the scenes. By pressing the HTML icon you will see the HTML behind the scenes. 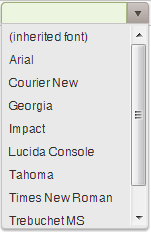 Selecting the HTML editor allows you to view, change, and update the HTML in that section of the site.